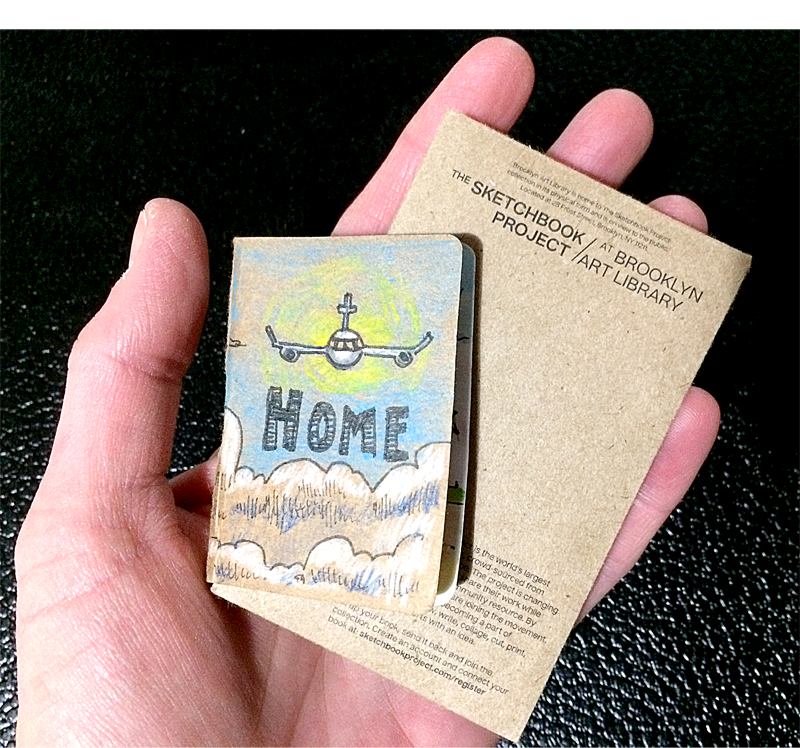 I’ve participated in The Sketchbook Project from the Brooklyn Art Library for multiple years, so when they announced a new project for TINY sketchbooks, I was all in! 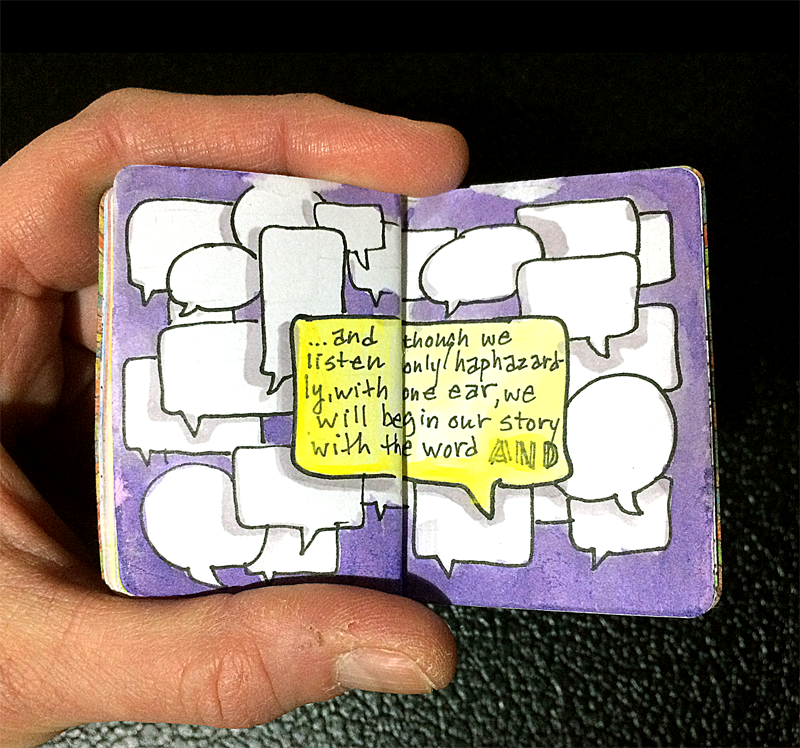 Imagine the smallest, daintiest little book, ready to be crammed full of visual inspiration. 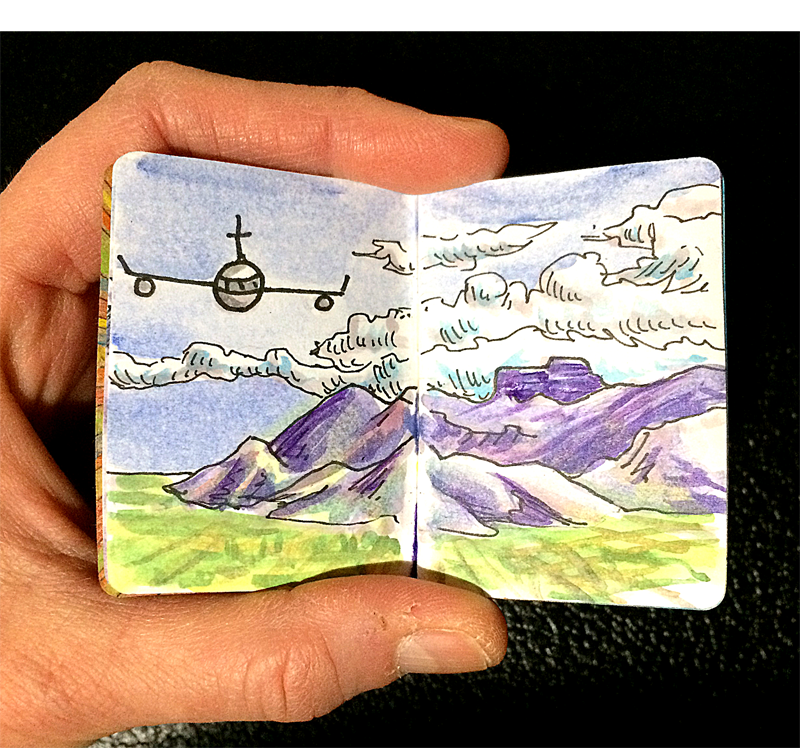 It’s like a Mary Poppins sketchbook…tiny on the outside and filled with stuff on the inside. With a delivery date of Feb 15th, I had to get things moving to make sure I completed it in time. 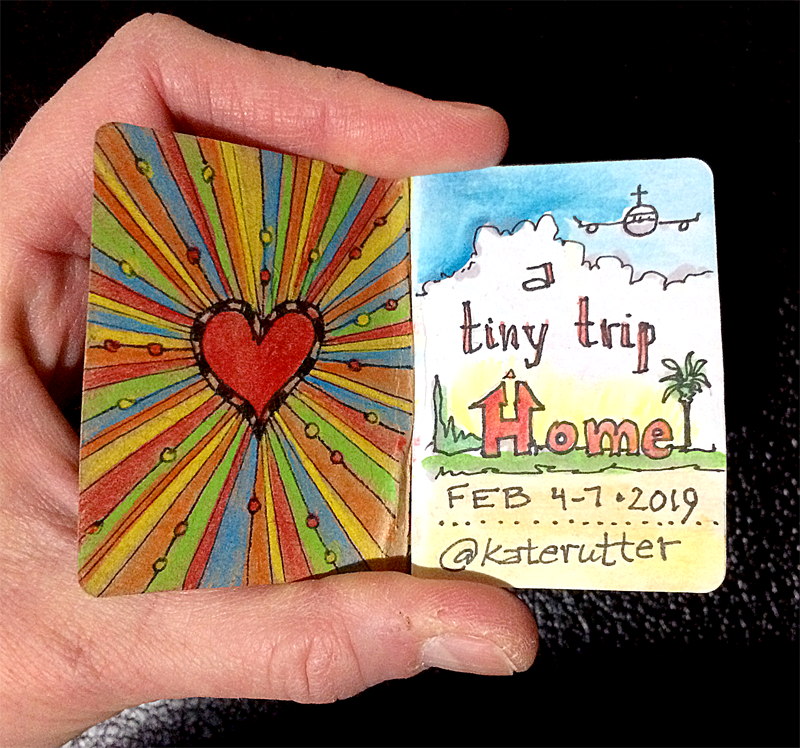 While on a trip to visit family in Tucson, I decided that making a tiny trip journal was perfect idea for the sketchbook. 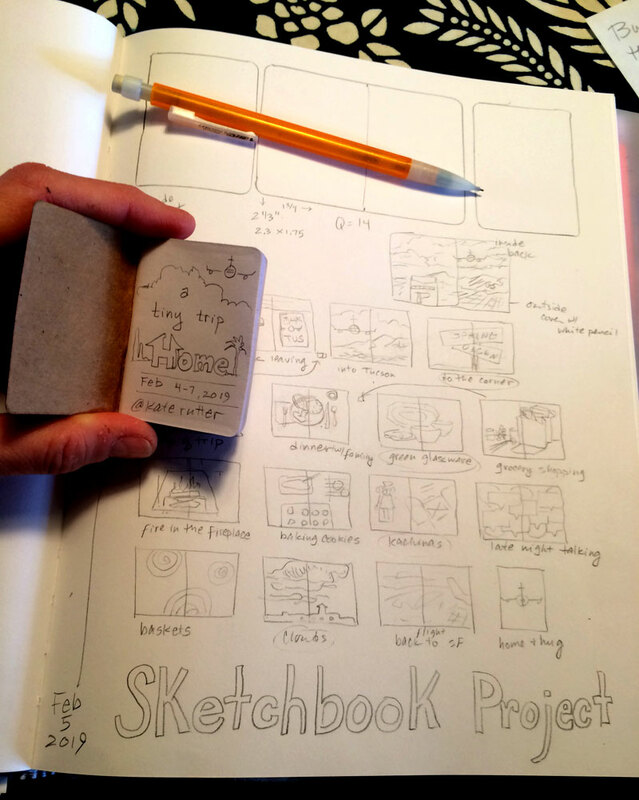 The process starts with rough sketches and thumbnails. 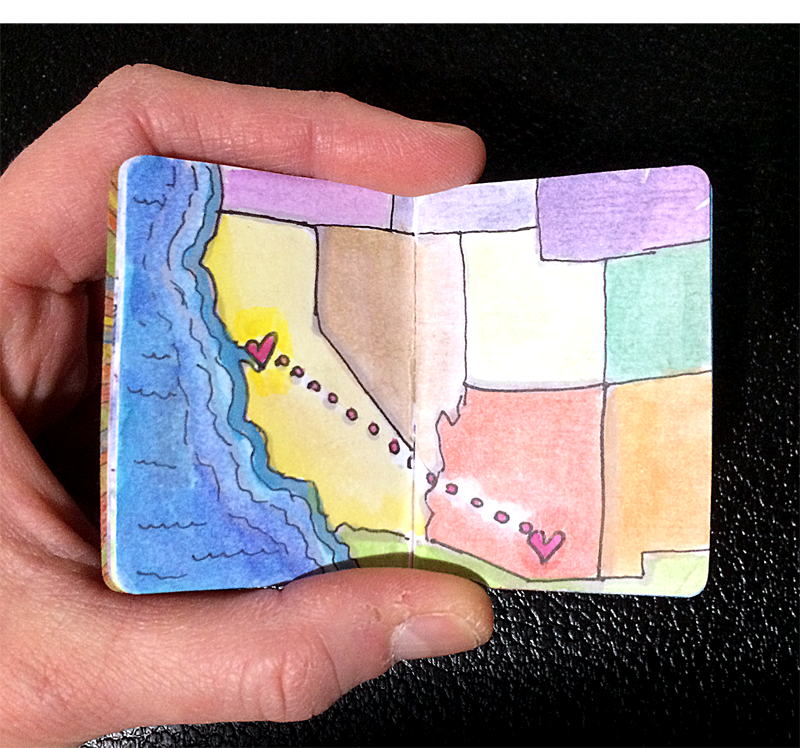 I measured the pages, since this was a new size for me. 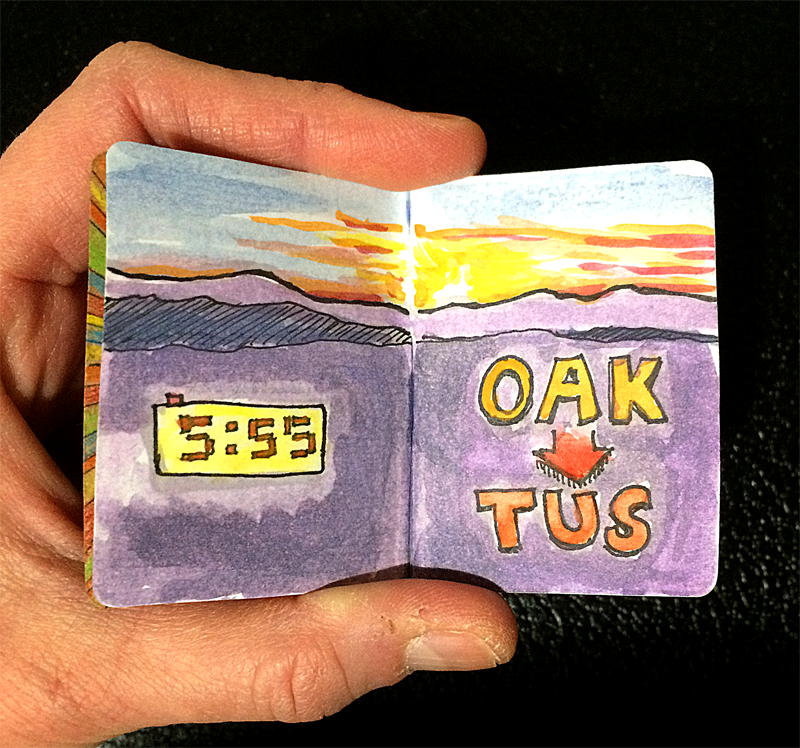 The ideas came from small (tiny) experiences I had during the trip. 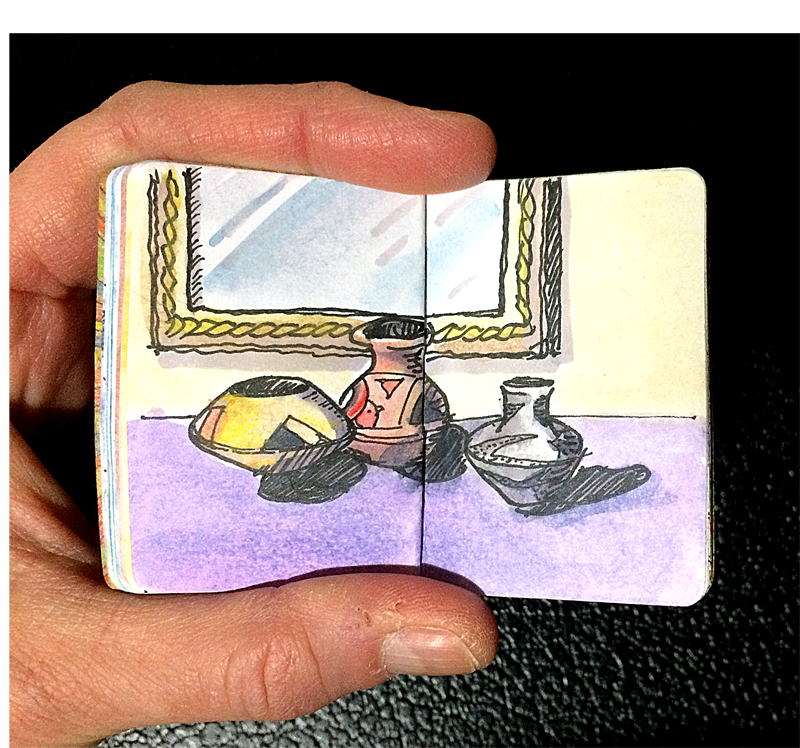 Since I was staying with family, I used some of the objects in the house as inspiration. 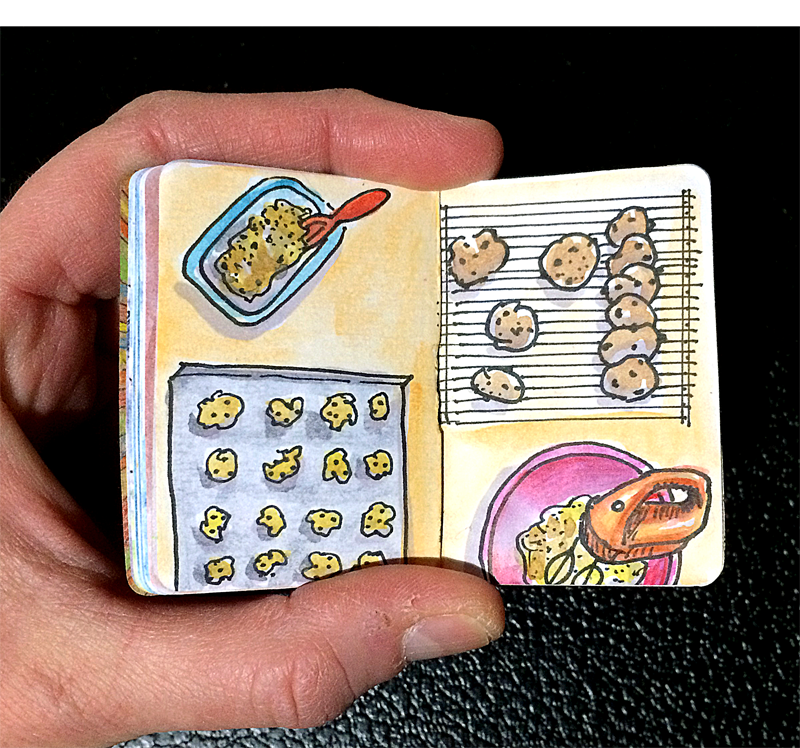 Thumbnails help visualize the flow of the images. 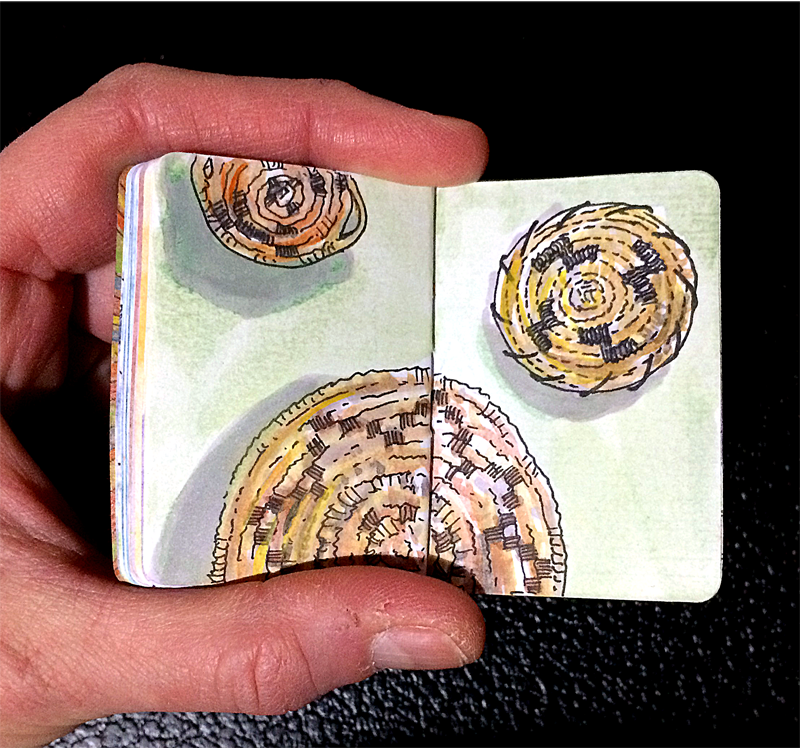 During my stay, I sketched the pencil images into the sketchbook…most from direct observation, and some from memory. 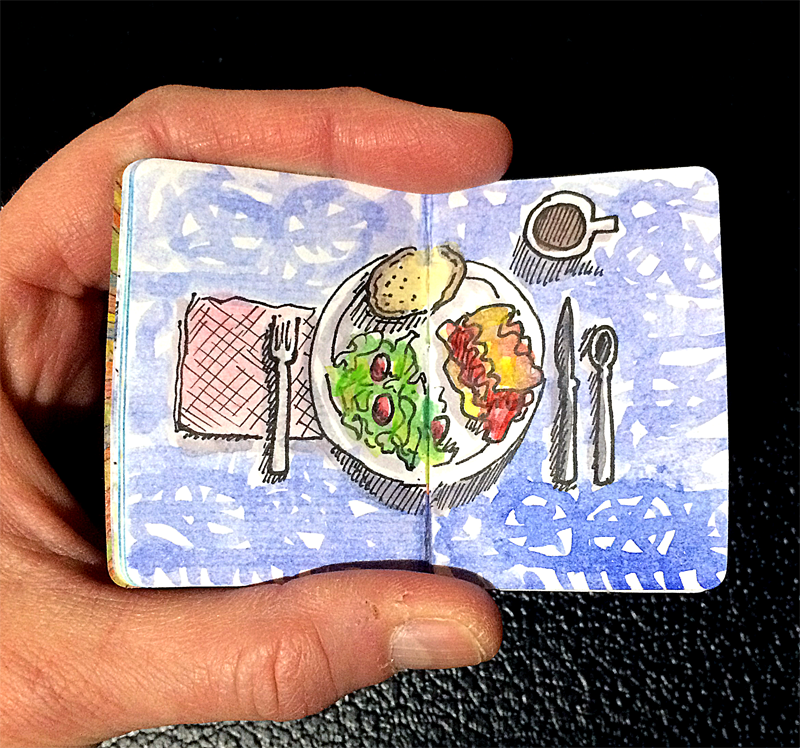 Each image is a vignette of a memory, experience or observation. With the pencil sketches completed, it was time to move on the inking. This happens in 2 stages: the first is outline, and then shading. 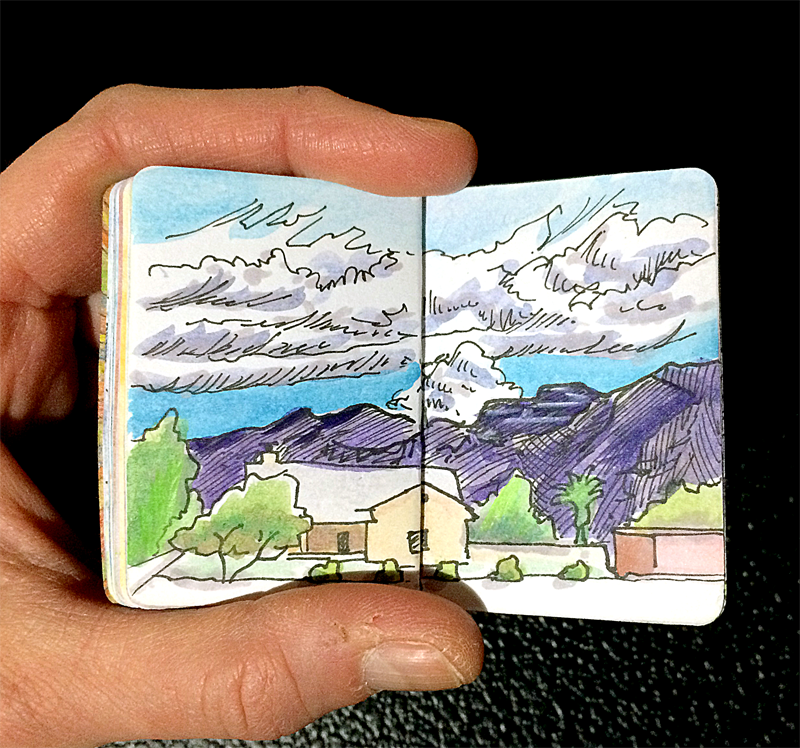 I left a blank page in between each spread to prevent the ink (and eventually, the watercolors) from bleeding through. 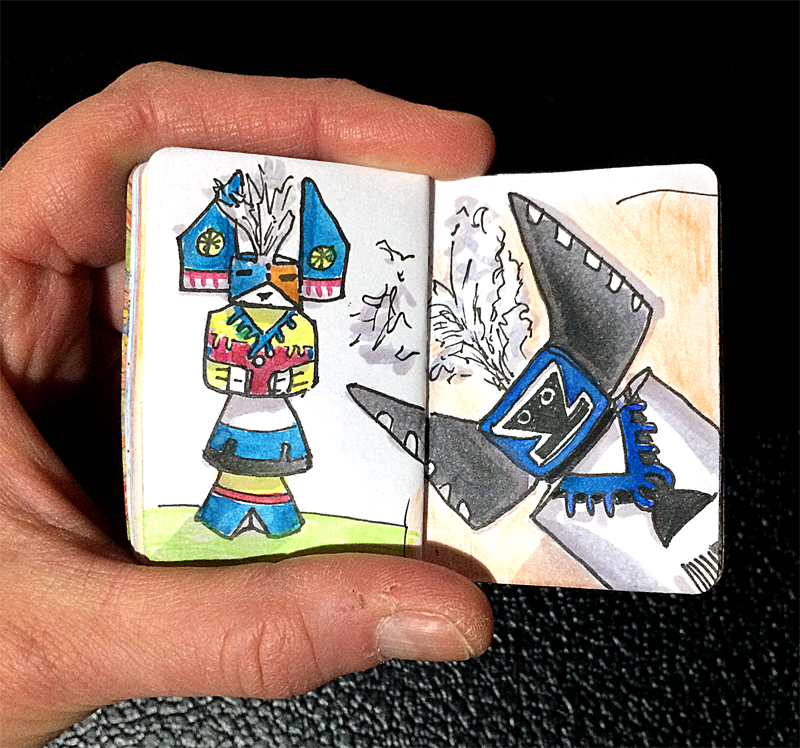 Here’s what the book looked like after shading was completed. 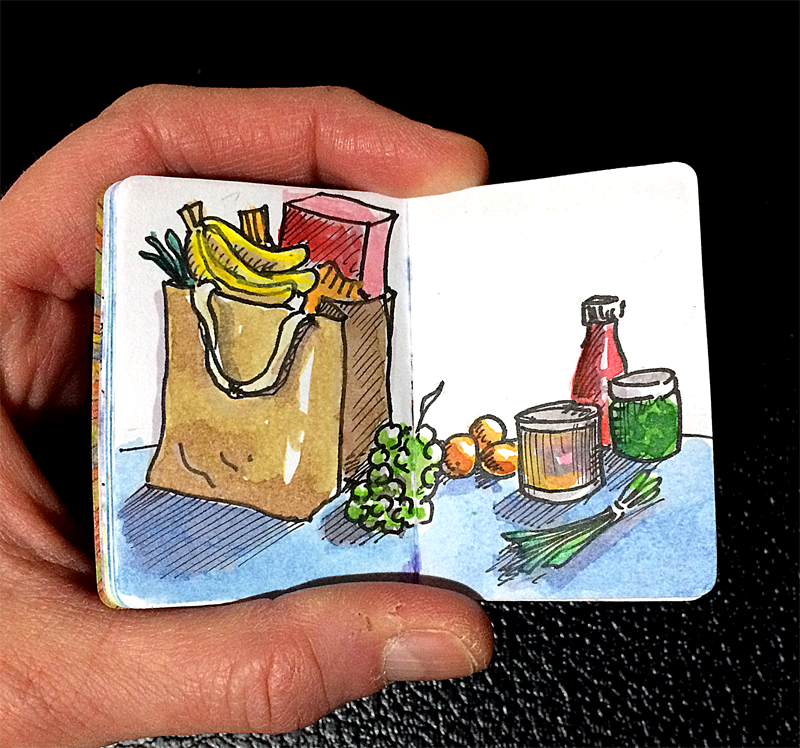 A tour of the sketchbook with inking and shading. Once the shading was complete, it was on to coloring. I used Prang watercolors and a waterbrush. 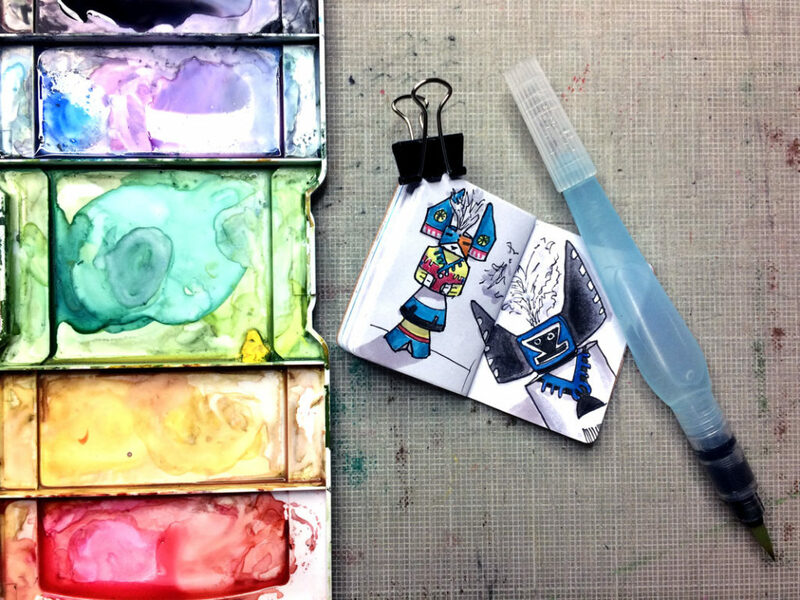 Simple tools: Prang watercolors, a Niji waterbrush and a binder clip. 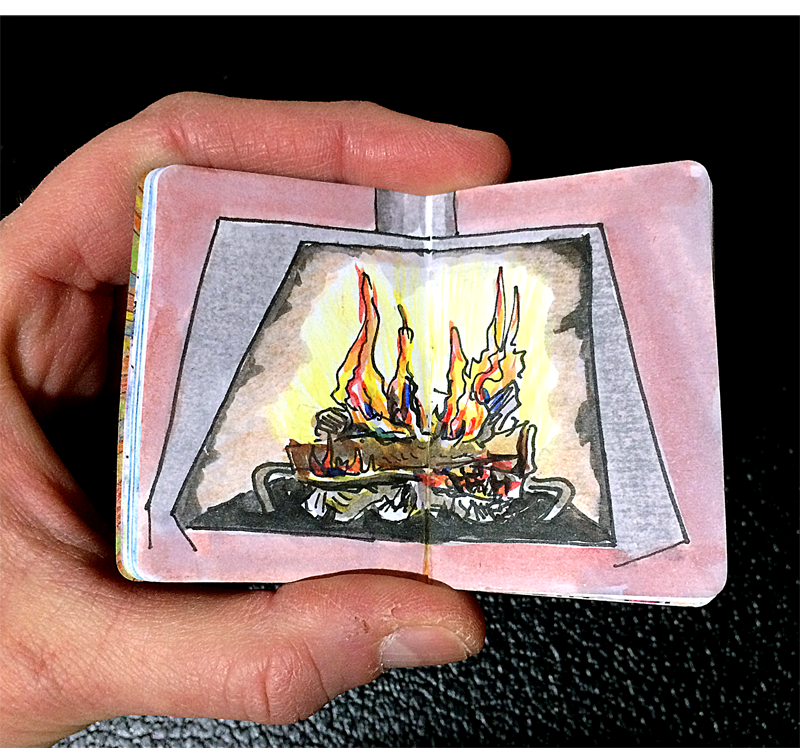 The last step was to stick the pages together, so that the blank sides weren’t visible. 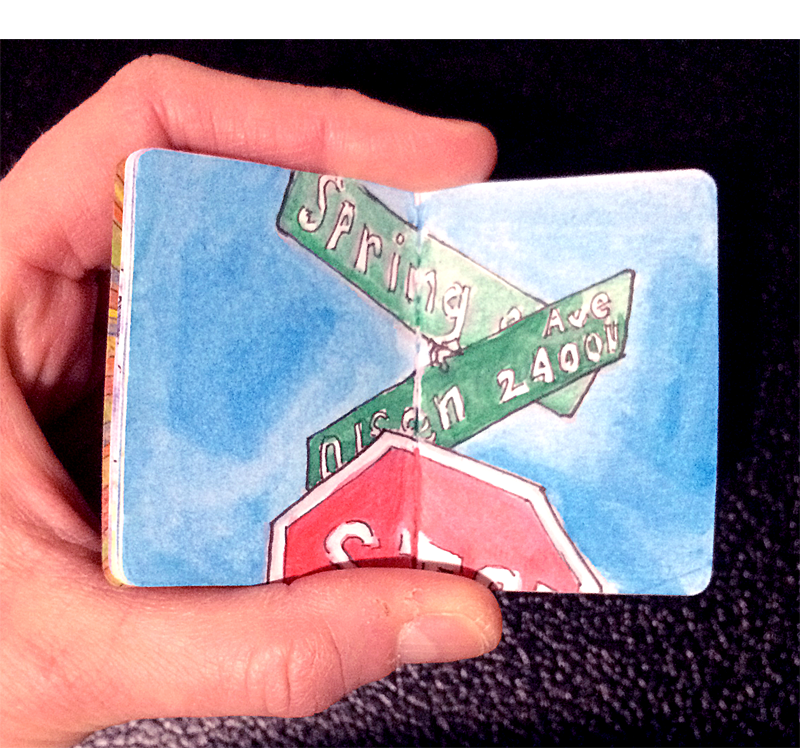 This made each page thicker and more durable, and also helped flatten the pages which were a little woobely from the watercolors. 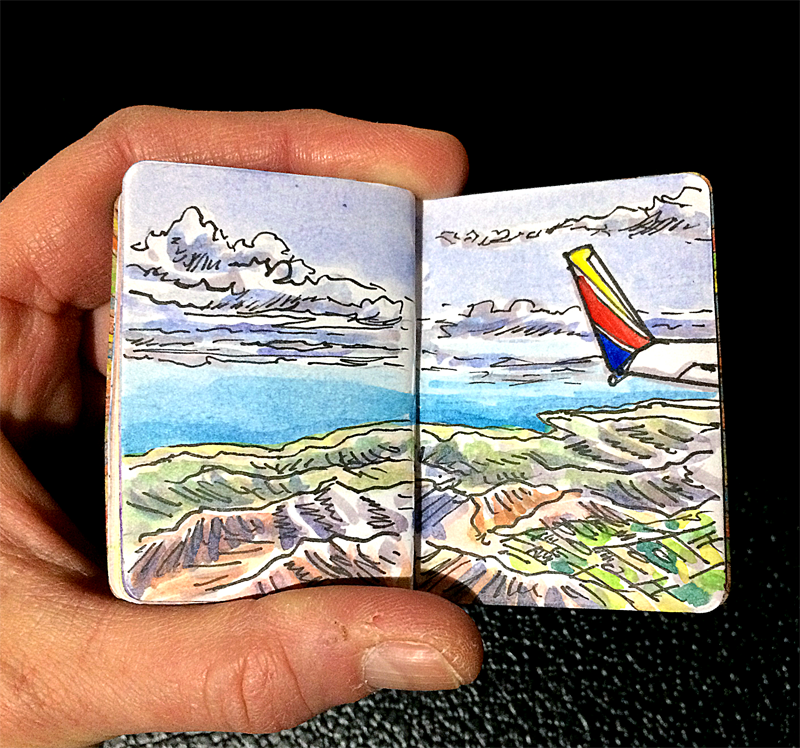 A tour of the completed sketchbook. Ready to mail in the morning. 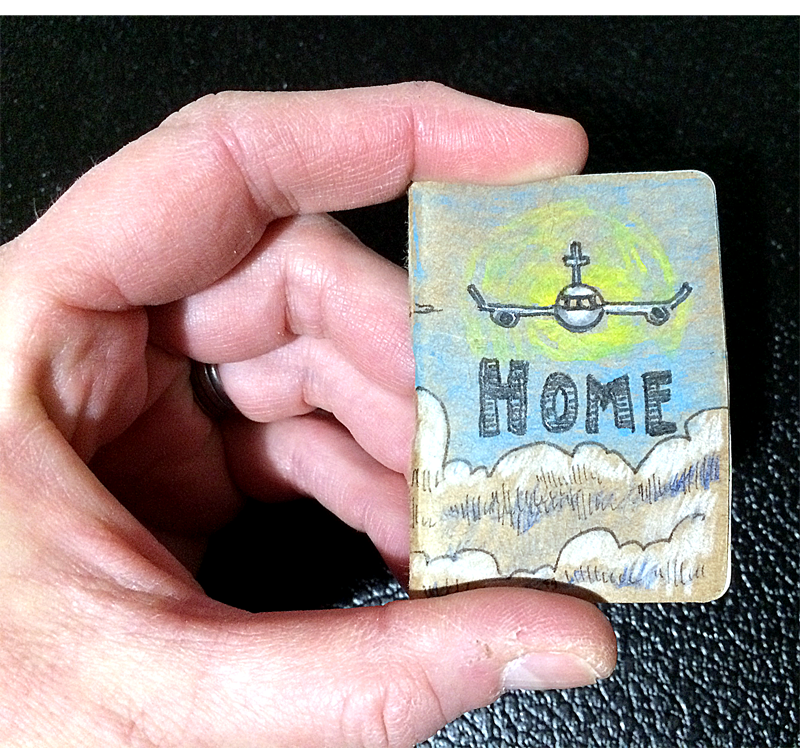 Godspeed, little sketchbook. 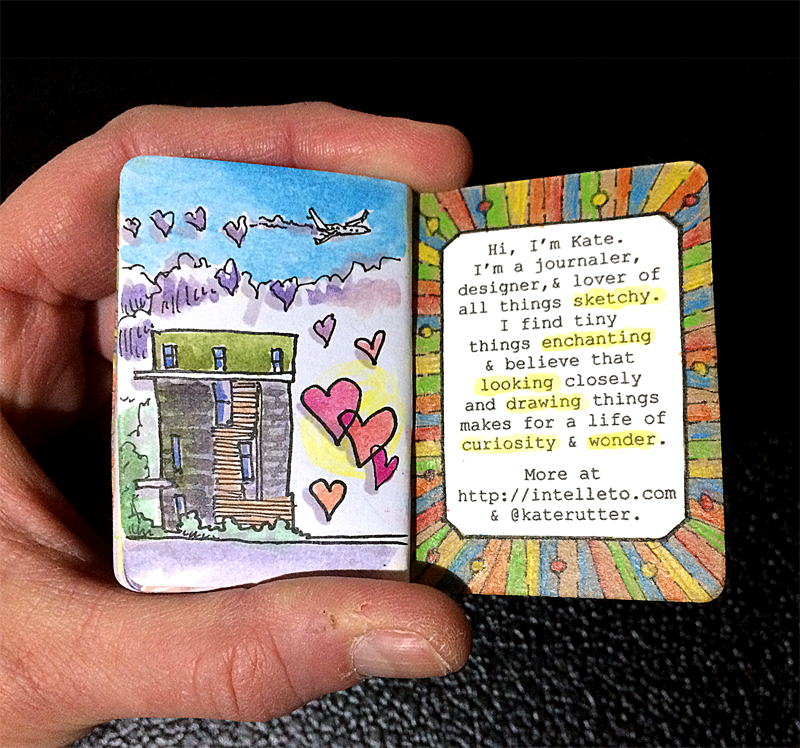 It was a lot of fun to work small and to fit a lot of memories into such a tiny format. 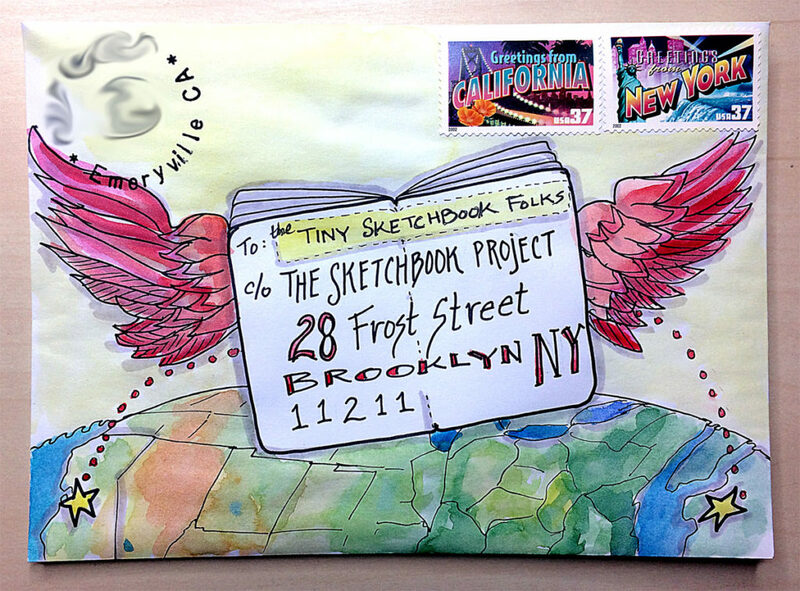 Watch for the Tiny Sketchbook tour to come to a city near you!